Original M. 1861 Stedman iron 6-pounder and SBR reproduction. Original goes to new Indiana State Museum, while reproduction remains in City of Franklin, where original had been for generations. Reportedly about a half dozen were made by the Stedman Machine Company at Aurora, Indiana for use in Civil Ware but without having ever achieved U.S. Government acceptance as regular ordnance. FRANKLIN, Ind. (AP) — A Civil War cannon displayed in Greenlawn Cemetery for decades is headed for the new Indiana State Museum in Indianapolis. The cannon, which recently underwent restoration, will be sent Tuesday to South Bend and later to Indianapolis, where the museum under construction in White River State Park is scheduled to open in May. 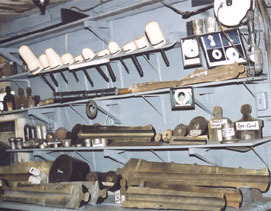 The Franklin Board of Works and Safety agreed to loan the authentic cannon to the museum for 10 years, with an option to renew the loan. The cannon will be the centerpiece for the new museum’s Hoosier Way gallery. 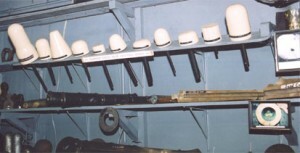 As part of the loan, the museum will provide a replica gun to Franklin in return. South Bend Replicas will build the replica, while a carriage for the replica will be built in Wisconsin. Construction is expected to take at least six months. The replica cannon will then be put on display in Franklin, but probably not in the cemetery. The cannon was built in 1861 by Stedman Co. of Aurora in southern Indiana. It was part of a gun battery along the Ohio River near the end of the war and was brought to Franklin by the Grand Army of the Republic after the War. 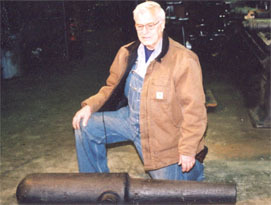 Chuck Wiard, descendant of family that includes gunmakers Tohomas Wiard and Norman Wiard, and Wiard foundry and plow industries, examines 2.6″ Wiard in SBR shop for bore restoration with Paulson sleeve.